Its always the same dilemma in branding. Should the brand appeal to a prospect's intelligence or connect at an emotional level? Well if the target is the college going or the recently outta college dimwit, big on Global warming, vegetarianism and that sorta thing, the latter is recommended. Right now that's the McCain dilemma. Should he the lose the tie, zip the toothy grin and turn the wisecrack? Maybe. 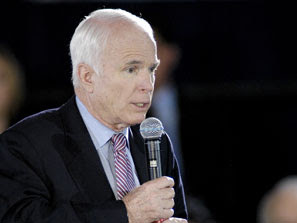 Read John Feehery's 'Branding advice' for McCain here.